We offer a veterinary compounding service to all vets. Our laboratory can formulate special dosage forms of drugs to meet the unique needs of pets, exotics and zoo animals and to help the veterinarian solve problems for patients with special medication needs. Additionally, we recognize the need for therapeutic improvisation which has long been a fact of life for veterinarians. …to name a few. Call us for a price list. Amlodipine, Atenolol, Azathioprine, Amitriptyline, clomipramine, Diltiazam, Enalapril, fluoxetine, meloxicam, metoclopramide, methimazole, Pimobendan, tramadol, Enalapril/furosemide/pimobendan combinations, etc. Our lab also produces cyclosporin and tacrolimus eye drops. We know how finicky animals can be when it comes to their diet. The same problem often occurs when one tries to administer a medication to them. 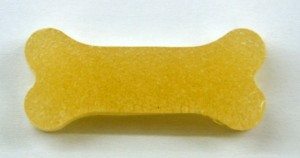 To help in such situations, our Compounding Laboratory can prepare medications in a flavored suspension, paste or chewy treat (see side image). Fish flavored medications for cats or beef and chicken for dogs while Pina Colada for birds are readily available. Often commercially available animal medications come in only one dosage or strength. In order to properly medicate small animals, a reduced dose often must be given. This can be a problem and a potential source of either over or under medicating, if the needed drug only comes in a solid form. Our Compounding Laboratory can provide the exact amount of medication per dose needed to treat smaller animals. Conversely, we can provide larger than commercially available strengths of medications and can format them into single doses. Frequently, drug manufacturers will discontinue the production of medications and dosage forms because of low demand and, hence, decrease profit. However, often there is still a need for these products. When a veterinary formulation is not commercially available and there is no human preparation that can be used, we can help. Our laboratory can obtain the necessary pharmaceutical grade chemicals needed to compound individualized dosage forms that may even out perform the discontinued formulation. Some animal problems, such as skin disorders, are often best treated using a combination of several drugs. In order to avoid multiple dosing while achieving cost-savings, our laboratory can combine all the needed medications into a single dose form. Veterinarians are welcome to contact us for a complete list of our compounded veterinary products. We produce eye drops, transdermal preparations, mixtures, capsules, chew treats to name a few.